THE CELEBRATION IN in Beijing on September 3rd to mark the 70th anniversary of the ending of World War Two in Asia will be a breath of fresh air. Heavy industry, power plants and construction sites in the capital, along with more in Hebei, Tianjin, Shanxi, Inner Mongolia, Shandong and Henan, are being shut down or curtailed between August 28th and September 4th to make the air less polluted. Some 10,000 factories and 9,000 construction sites will be affected, state media say. The goal is to cut pollution on the day by 40% in the capital and 30% in the surrounding region. The measures are similar to those taken during the 2008 Olympic Games and last year’s the Asia Pacific Economic Cooperation (APEC) meetings so that visitors wouldn’t have to breathe in the filthy atmosphere residents have to suffer the rest of the year. The tail end of the Athletics World Championships due to start in Beijing on August 22nd and run until September 6th will also get some benefit from this year’s effort. One difference this time is that Beijing authorities have also ordered a complete halt to production at explosives plants and the sealing under guard of all toxic chemicals in the city. In the wake of the Tianjin disaster, Beijing wouldn’t want the 70th-anniversary parade going off with the wrong sort of bang. THIS BYSTANDER HAS only recently come across the photographs that U.S. astronaut Reid Wiseman has been tweeting from the International Space Station. 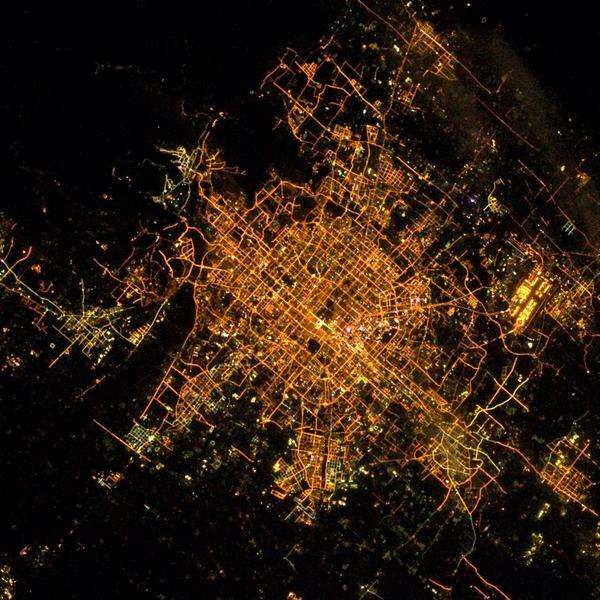 This one of Beijing taken earlier this month is almost a work of art. Train G502 on the inaugural run of the Beijing-Guangzhou line, the world’s longest high-speed rail line. Passenger service has started on the world’s longest high-speed rail line, connecting Beijing and Guangzhou, a journey of 2,298 kilometers. The link cuts the travel time to eight hours from 21. It is a centerpiece in the build-out of the country’s at times scandal and safety-plagued high-speed rail network which is due to cover 16,000 kilometers by 2015. By then, the Beijing-Guangzhou line is due to be extended to Hong Kong. Following the heavy rains that recently inundated Beijing with such loss of life, the capital is to build 20 underground flood pools to relieve future storm flooding. They will be put under places known to susceptible to flash floods, low-lying roadways in particular. A conventional surface flood pool is the land around a reservoir that is intended to be flooded in the event of extreme rains as the reservoir rises and backs up. The excess water is then run off by being released through the reservoir’s dam in subsequent days. Underground storm water storage works in much the same way, temporarily holding storm water until a city’s drainage system can handle it. Flood pools are not only a common form of flood management, but, smartly managed, are also a potentially profitable source of municipal water supplies, irrigation, recreation facilities and fish or wildlife habitats, Beijing’s flood pools won’t bring such broad public goods as far as we can tell. They will have to be fitted in between all the other subterranean construction beneath a long-established city: sewer and water pipes, subway lines, building foundations and the like. Modern underground storm water storage systems are often modular, so can be constructed as shape and space allows. Alternatively they can be built from large diameter pipes and threaded around obstructions. Their capacity is typically equivalent to a swimming pool and are easiest to retrofit to places like roads and parking lots that can be dug up and the systems installed under them. Urban flooding is a worsening problem in China (and elsewhere) as global warming, urbanization and industrialization pose a growing triple threat to cities’ natural defences, defenses urban planners have anyway been concreting over with reckless abandon. It is, though, reasonable to ask why there hasn’t previously been more provision to deal with flash floods in the capital. Hong Kong, for one, has underground storm water storage in several of its towns already and is planning to build more, notably in Happy Valley on Hong Kong Island which is to get an award winning, state of the art flood pool at a cost of HK$1 billion ($130 million). Hong Kong had the advantage of being able to build the lower -tech tanks it already has into its new towns from the outset, a luxury that Beijing doesn’t enjoy. Urban planners are only now realizing that they have to make cities greener so they are less encouraging to extreme weather. All the newly constructed impervious surfaces such as roads, parking lots and rooftops, create run-offs that existing urban drainage, often old and inadequate, can’t handle. can’t handle. Not only is ground storage for rainwater scarce and run-offs from hard surfaces absent, ancient streams that could carry rainwater to rivers and ponds that could help it find its way to acquirers below have been filled in. As Beijing’s are expensively learning– the economic cost of the recent floods is estimated to be at least 2.3 billion yuan ($360 million), before the cost of installing the new storage tanks–they need to create the modern urban equivalent of something nature has provided naturally. The flooding that hit Beijing a week ago (above) was a freak. The rains that caused it were the heaviest in 60 years. Severe weather, certainly, but not beyond the bounds of what a national capital should be prepared to deal with. And certainly not with as heavy a loss of life, 77 dead. It has revealed weaknesses in urban planning, construction, infrastructure and emergency management. “We must seriously reflect on these lessons and always bear them in mind,” Guo Jinlong, Party boss in the city, says. Quite. Urban flooding is a worsening problem in China (and elsewhere) as global warming, urbanization and industrialization pose a growing triple threat to cities’ natural defences, especially those of cities in developing economies. But beyond the human costs are the economic disruption as transportation, communications networks and electricity supplies, the arteries of modern cities, are put at risk of seizing up. Authorities’s preliminary estimate of the economic cost of the recent floods in Beijing is 2.26 billion yuan ($360 million). Over the past 30 years, floods have been getting bigger and more frequent around the world but no region has been more affected than the Asia-Pacific and no country in the region more than China. (A list of Asia’s worst floods since 2000 is here.) More than 100 million Chinese have moved from inland areas to flood-prone coastal cities in the past quarter of a century. Yet China has only recently started to shift its emphasis from reacting to urban flooding to preventing it, and, as it happens, at about the same stage in its development as Japan started to do three decades ago. Taiwan and South Korea have also since followed suit. Floods in cities are both more costly and difficult to manage than those in the countryside. Building adequate main sewers and storm water drains to manage urban rainwater is straightforward enough in greenfield developments. The difficulties lie with older built-up areas. There sewers and storm drains are often old and inadequate, run-offs from hard surfaces absent, ground storage for rainwater scarce and ancient streams that could carry rainwater to rivers and ponds that could help it find its way to acquirers below, filled in. An irony of the Beijing floods is that the aquifer below the city is drier than ever. Redressing these problems are huge engineering tasks that cities cannot complete overnight. But starts have to be made. Beyond that are longer-term policy issues of not allowing development in flood-prone areas, giving local districts within cities the information to make their own local anti-flooding preparations, and making cities greener so they are less encouraging to extreme weather. From 2011 to 2020, China’s investment in water conservancy projects, including flood defenses, is expected to reach 4 trillion yuan ($617 billion), almost four times as much as that spent during the previous 10 years. Yet nature has provided lakes and floodplains to do the same job. An important part of fighting floods, and one of China’s other perpetual natural disasters, drought, is the protection, restoration and reconnection of lakes, ponds, streams and floodplains so they can do what they do best: take in water when the river is high and give it back when it is low. Rivers and lakes cannot be infinitely sacrificed or bent to man’s will in the name of economic development. Urban planners have only just started to apply the lessons of that. China’s developers will have to be made to, too. So serious has the depletion of China’s groundwater become as a result of industrialization and urbanization that the country’s large cities are sinking, as, potentially, are the high-speed rail corridors between them. So concerning is that to authorities that the State Council has made areas with high-speed rail links a priority in a new land subsidence research project it has approved to be completed by 2015. In the order of these things, that is a crash deadline. The survey is one of four projects that the Ministry of Land and Resources said this week that the State Council had ratified to combat the effects of China’s growing water shortage. Others include yet more controls on pumping underground water, and the setting up of monitoring networks in the worst affected areas–the Yangtze river delta, the North China Plain and the Fen and Hua river basins. The network is to be in place by 2020. It didn’t take any technology to see the 8 meter crack that opened up earlier this month in a road near the Shanghai World Financial Center. (There are some pictures here.) That is despite authorities taking preventive measures since 2005 to combat ground subsidence caused by falling water tables. Municipal officials say the city is still sinking by seven millimeters a year. That is a better state of affairs than in the past, however. Shanghai used to be sinking by several centimeters a year. A third of China’s water reserves lie in underground aquifers. They supply 70% of the country’s drinking water and 40% of its farm irrigation needs. They are being stretched to their limits, particularly across the grain belt of the North China Plain as evermore wells are sunk to draw water for city dwellers and industry. Underground water pollution is a separate concern, but as serious. Shanghai is one of more than 50 large cities with a similar Venice-like problem of subsidence because the water table below it is sinking. Beijing, Tianjin, Hangzhou and Xian are among others. As the number of 50 cities has been quoted since at least 2006, we suspect it may undercount the problem today. In a paper the China Geological Survey published that year the direct economic cost of subsidence was put at 1 billion yuan ($160 million) a year. It will likely top that now. Tianjin, which like Shanghai has been sinking since the 1920s although it wasn’t until the 1960s that it was understood why, shows why widespread limits on groundwater pumping are so urgent, and also how difficult it is to control subsidence. The city introduced restrictions as long ago as 1985. Its sinking has slowed from 80 millimeters a year then but is still dropping 20 millimeters a year now. Coastal cities share another characteristic with Venice. Floods are becoming more frequent and severe. The lower cities sink the more susceptible they are to them. We have noted before the potential explosive social costs of a water crisis getting beyond the government’s control. It will take a comprehensive program of water conservation, better water resource management and better husbandry of the ecosystem. And there are plans on all those fronts. But if they fail, it will be more than a high-speed train or two that comes off the rails. Shenzhen has been added to the list of provinces and municipalities that will pilot China’s proposed carbon trading market. That takes the initial set to seven. The participation of Beijing, Chongqing, Shanghai, Tianjin, Hubei and Guangdong has been known since the summer. An official with the National Development and Reform Commission confirmed the go-ahead with the pilot scheme to Xinhua, but otherwise details remain sketchy. Central government has still to set overall carbon discharge reduction targets, which are a prerequisite for establishing the national carbon trading market that has been pencilled in for a 2015 launch. By then, China’s goal is to have cut carbon dioxide emissions per unit of GDP by 17% from 2010 levels, according to a white paper on climate change issued this week ahead of the UN’s forthcoming climate change talks in Durban in South Africa. A reduction of that magnitude will be a tough ask given the pace of the economy’s growth. The pilot carbon-trading scheme is expected to start in 2013.